One might think that after being able to bring the launch date forward from 15 to 3 April (since when do launch dates come forward? ), that after successfully achieving the shortest launch campaign in ESA’s history, after having executed the pre-launch simulations in the shortest time ever, after a flawless launch, after a perfect (although incredibly complex) deployment sequence of the solar arrays and radar antenna, after managing to publish the video of the satellite separation in record time (when have we had such a beautiful view before? 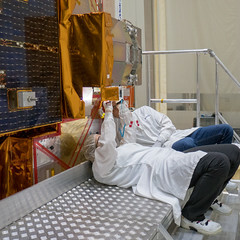 ), after publishing the first ever ‘selfie’ of an ESA Earth observation satellite …… after all of this you might think that you would have time to relax, just a little. One might think. But, in the Sentinel-1 project, the point at which you can relax— as Ramón puts it – “a point of accumulation’ of hope, a point in the space-time that you can glimpse but never reach”. It is decided to manoeuvre Sentinel-1A. Its orbit altitude needs to be changed to escape the chaser. Decision taken: this manoeuvre is the first one of the mission, before the subsystems could be commissioned, we go for the lowest risk – which is a weird expression to use in this case. Patiently, Ian, who Pier Paolo secretly calls ‘his bodyguard’, takes the satellite into nominal pointing mode. He earns even more recognition tonight: ‘after your mother, his are the safest hands you would leave yourself in as a child’. We are ready for the manoeuvre that takes 39 seconds. The sequence of commands was uplinked during pass 37 in Alaska/Svalbard/Kiruna/ at 04:33 UTC for execution at 05:14 UTC, outside visibility. 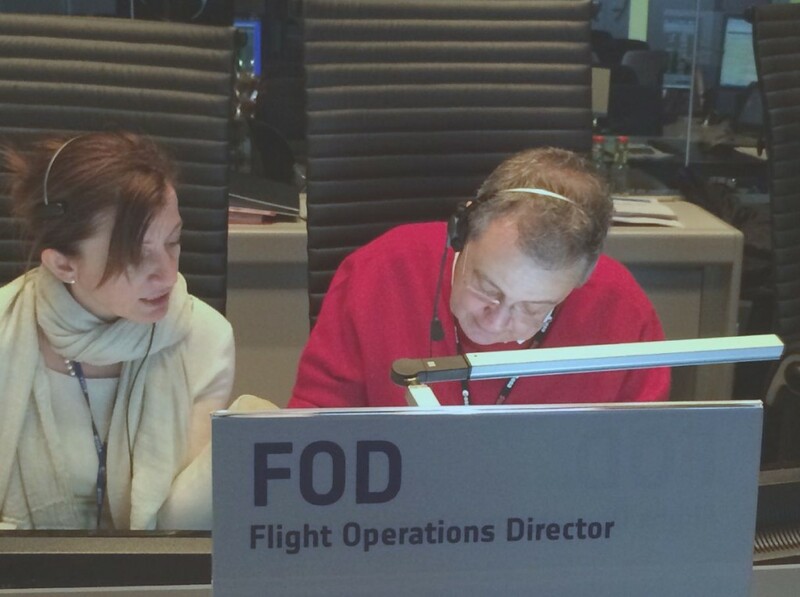 The atmosphere was tense and the Main Control Room was filled with suspense. Eyes were looking up at the big screens on the wall, waiting for a sign. As the satellite approached Troll ground station on the next pass and the telemetry started to scroll down in the twilight of the control room, the team hold their breath…and yes, the satellite was in Orbit Control Mode and the GPS on-board shows a change in the orbit status … Yes! the manoeuvre has been successful! For the first time that night, loud laughs and cheers bursts through the room. We are safe. Finally, the formal hand-over is complete and everybody goes to their position. And then, something unexpected happens: the night shift guys don’t want to leave their positions! A bit of discussion, then the boss, Pier Paolo, declares a ‘general briefing’ for the night shift guys in the adjacent room, where the refreshments are. Everybody executes the orders. That’s the moment: the ‘day shift’ guys are in place at the consoles. Everyone in the night shift group gets half a cup of the remaining coffee that once, a long time ago, had been warm. And then something really exceptional happens – we are drinking the best ever coffee in our lives; how is this possible? Another ordinary night in the Sentinel-1 project life over, it is the turn of the day shift team to play with the baby now. Space is busy. That’s well known, but you would not believe that the remains of the satellite of a befriended agency might get in the way of such a prestigious satellite. Good luck … and keep your eyes open. Lots of other satellites out of control up there in orbit. Hollywood right around the corner! What a thrilling story and so close by! Well done guys, you evade well! Based on my calculations, it looks like the NASA satellite was ACRIMSAT? I get close approaches at Apr 5 0921 UTC, 1011 UTC, 1149 UTC so a little different from the times you quote, but my calculation is not very accurate. I think Space Debris and Flight Dynamics teams really deserve a mention in this blog. They will have calculated the certainty of collision and calculated the manoeuvre characteristics with uncertainties and associated risks. The pressure must have been immense. Congratulations! Really a well done job. And please lets not forget the industrial team who worked behind the scenes at ESOC in order to get the satellite (which was barely off the launcher) to make a manoeuvre like this. Without whom the satellite would almost certainly have been lost. Thank you for putting a real-life engineering, operations and space situation into such a well-written story. Well done everyone! We never forget our industrial team. Not only they have developed and delivered to us a wonderful spacecraft (whose top quality becomes evident to all every day more); their people were there in assisting the manoeuvre and all the decisions that led to it together with the ESA team. In fact, we consider ourselves, industries (not industry) and ESA (ESTEC, ESOC, ESRIN, etc) just one (enthusiastic and successful) team.